While speaking at an event hosted by the Council on American-Islamic Relations in March, Omar discussed the anti-Muslim sentiments  that many American Muslims endured since 9/11, saying that they had been lumped in with terrorists and had their civil liberties attacked because “some people did something.” Conservatives immediately pounced on her comments, claiming that she was dismissive about 9/11 and demanding she denounce the terror attacks. On April 12, Trump tweeted a video  splicing Omar’s comments with footage from 9/11. Trump drew immediate criticism from Democrats, who noted the danger in suggesting that a Muslim American doesn’t care about the 9/11 terror attacks. Trump’s tweet came the same day one of his supporters was arrested  for threatening to kill Omar. 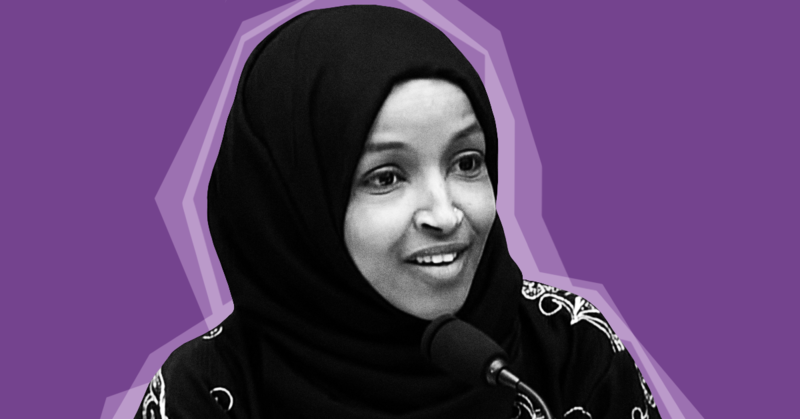 Over the weekend, Fox News figures  and guests  criticized Omar’s comments as well as members of Congress who defended her, claiming that they were simply trying to shut down debate. On April 14, Omar’s team shared a statement  that said, “I have experienced an increase in direct threats on my life--many directly referencing or replying to the President’s video, … It has to stop.” House Speaker Nancy Pelosi (D-CA) had earlier released a statement  saying that she had spoken with authorities “to ensure that Capitol Police are conducting a security assessment to safeguard Congresswoman Omar, her family and her staff.” On April 15, Trump again tweeted  another smear that said Pelosi should look at Omar’s “ungrateful U.S. HATE statements,” accused Omar of controlling Pelosi, and urged Pelosi to condemn her. Since Omar was sworn into office, Fox has repeatedly questioned her patriotism and smeared her over bad-faith interpretations of various comments made by Omar. In March, Fox host Jeanine Pirro  drew criticism for implying that Omar’s hijab and “adherence to this Islamic doctrine” is “antithetical to the United States Constitution.” The day before, Pirro suggested  that Omar is representing other countries in Congress. Fox & Friends host Brian Kilmeade  claimed that “you have to wonder if she’s an American first” before lecturing Omar on how she should represent Muslims. Later that night, Fox Business host Lou Dobbs  asserted that Omar “sounds like she hates America,” Jews, and Israelis. Fox Business host Trish Regan  has also questioned Omar’s patriotism, claiming that she’s “seemingly anti-American.” Fox has also twisted Omar’s criticism  of Sen. Lindsey Graham (R-SC) to baselessly accuse her of homophobia.